Getting customers used to be a simpler affair. Stick enough ads in people’s faces, and they would notice and buy. But marketers these days face a whole new challenge. Take Susan, who leads the marketing efforts at a wireless systems vendor. She cooked up the prettiest, smartest ad campaign that anybody had ever seen for her company’s new router, and it grabbed hundreds of eyeballs each minute online and on the street. But sales didn’t leap through the roof. It was because her smart, pretty ad was just another voice in the crowd. Modern consumers are so constantly bombarded by ads on billboards, television, newsprint and digital they tend to, subconsciously, condition themselves to ignore them. But this “emotional unsubscription” can be broken through. Most people don’t like being sold to, but everybody likes learning new and useful things regularly. This is the crux of content marketing – earning trust, and ultimately loyalty, by helping customers make smarter decisions. Yet, a mere 32% of enterprise marketers surveyed by the Content Marketing Institute believed their own content marketing efforts were effective. There are several reasons for this. For one, content marketing is often ill-defined. Ads that are nothing more than witty sales pitches can, and have been, touted as “content marketing”, which only dilutes the practice. An ongoing initiative, not a one-off effort. Focused on customer’s pain points, not the offering. Not merely entertaining, but also helpful and educational. The lack of any overarching strategy is also a problem. In many cases, companies treat content marketing as a tactical affair, driven by ad-hoc needs: they have a campaign to run, and set out to create content for it. This back-to-front approach results in a highly fragmented content identity. And it gets worse the larger the organisation gets. Individual departments cook up their own ideas, content becomes sporadic and scattered, and no cohesive message emerges. Content marketing does not begin with brainstorming what to say. It begins with thinking about why you are saying it, who to say it to, and how to go on saying it. In other words, setting up the framework. A good first step is to segment the target audience into personas, and map content to these based on pain points, relevant topics, appropriate channels for syndication, and the different stages of the prospect life cycle – awareness, conversion, engagement or beyond. Then, take stock of existing material such as product literature, data sheets and industry reports. These can serve as the basis for new content – blog posts, e-books, visual explainer videos, video case studies, infographics that distil complex trends into at-a-glance views, and more. Created from scratch, with help from subject matter experts. Repurposed from old material, with a fresh spin. Curated from external sources, with attribution. Ideas for content spring from balancing the things you want to tell consumers and the things consumers want to hear. With the idea in hand, the next challenge is making it relatable. That means using human language – leaving out the “gobbledygook” and vague, overused buzzwords such as next-generation, world-class, cutting-edge, best-of-breed, and so on. Those only cause readers to space out and lose interest. Content has to also be about their context, and not your product. Modern consumers have highly evolved radars when it comes to informational content; it doesn’t take much to detect that a supposedly “educational” piece is in fact a carefully disguised pitch or advertorial. Consumers and prospects are typically more inclined to trust content that is vendor-neutral or “agnostic” than even the most well-intentioned branded content. Which can result in two things: they decide it is not relevant to their needs and move on or they realise they are being herded and hit their emotional unsubscribe button. So, avoiding self-promotion may not always be enough. Tie key specifics in your content to industry trends – the “big picture” – rather than your brand, and avoid trains of logic that lead to your product being the “best” or “ideal” solution. These help establish your organisation as two things: an authority, and a source of impartial, trustworthy information. In the bestselling Switch: How to Change Things when Change is Hard, Chip and Dan Heath postulate that our thinking and decision-making are driven by two opposing forces: logic and emotion. They paint these as a rider (the rational mind) trying to steer an elephant (the emotional mind). Good content should appeal to both for maximum impact. Appeal to the rider with logical elements, like hard facts and ROI calculations, while motivating the elephant with story driven elements such as case studies. But telling an interesting story around any product is not as simple as it sounds. There are lifestyle products, and then there are products that would make odd conversation topics in polite company. Some brands such as the iPhone or Louis Vuitton get people talking because products like these are more than products – they are personal statements. Hence, the endless iPhone versus Android debates around the lunch table. But few, if any, are inclined to discuss things that have far greater utility such as their favourite detergent or the newest printer in the office. If it’s hard to talk about a product, talk about its category. Think about where the product fits into a consumer’s particular situation and needs. Take toothpaste: it is an essential product, and certainly more important than fashion, yet not worth conversing over. So instead of talking about toothpaste, talk about an issue it’s closely related to that everyone cares about. Like oral hygiene. Once the content is developed, distributing or syndicating it seems straightforward. After all, this is the age of social media, and the audience is on social networks such as Facebook. The conversations are happening there. So it makes sense to anchor your content marketing to a Facebook page or Twitter handle. But what happens when Facebook changes its rules of engagement? This is not a what-if scenario. Not too long ago, Facebook jolted the marketing world out of bed with two major policy changes: deflating organic post reach to a measly 2% to 5%, and banning the practice of fan-gating Facebook contests to acquire followers. Don’t build your house on rented land. Invest in your own website or blog and use social media for syndication and building a community. These underscore the fact that renting a content platform is like being a tenant under a fickle landlord. No matter how well-executed and well-planned, content marketing can still fail if it is based on a platform you have no control over. Invest in a platform you own, like your company’s blog. This is your content hub, the “hub” of the wheel, and social media platforms are the “spokes”. Use social media for content syndication, engaging with readers, and building communities – but it cannot be the centre of a content marketing effort. Content marketing is not some newfangled fad – it is marketing. Like chefs “giving away” their recipes on cooking shows and in cookbooks, it builds audiences, and earns their loyalty, on the fact that people want useful information instead of hard sells. In a world over-saturated with advertising and brand messaging, this may be the only reliable way to reach prospects – because they are growing smarter, and more informed. They trust only their own research – and by the time they reach out to you, as much as 80% of their purchase decisions may already be made. You can help that decision along by engaging, entertaining and educating them as they research. Will you ignore this opportunity? A leading global provider of ICT solutions, including cloud services, Dimension Data maintains its Asia Pacific presence in more than 60 offices across 13 countries. GetIT supported Dimension Data with building demand and generating leads for its enterprise cloud portfolio, focused around several key themes such as infrastructure-as-a-service and unified communications and collaboration in the cloud. GetIT helped create a content brand independent of the Dimension Data corporate website – Enterprise Cloud Asia. 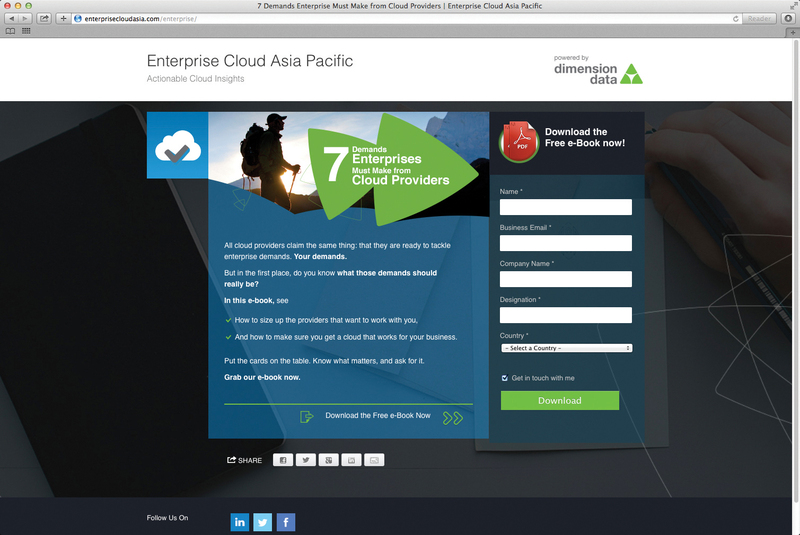 Enterprisecloudasia.com is a repository of free agnostic content on hosted cloud solutions. These articles and e-books, created through collaboration with cloud experts and re-purposing of existing Dimension Data material, provide vendor-neutral perspectives and insights on key concerns surrounding enterprise cloud services. One example is 7 Demands Enterprise Must Make from Cloud Providers, an e-book designed to educate business prospects on the crucial issues to bear in mind when screening enterprise cloud vendors. This and other Enterprise Cloud Asia content is syndicated through Dimension Data’s existing client databases, as well as partnerships with tech publications such as TechTarget and Questex. Google Ads re-targeting is also utilised to attract back visitors that do not fully explore the site before leaving. To gauge content effectiveness, GetIT integrated CMS and marketing automation into Enterprise Cloud Asia. These give visibility into site visitors’ behaviour – which pages they visit, which e-books they download, how much time they spend on articles, and so on. 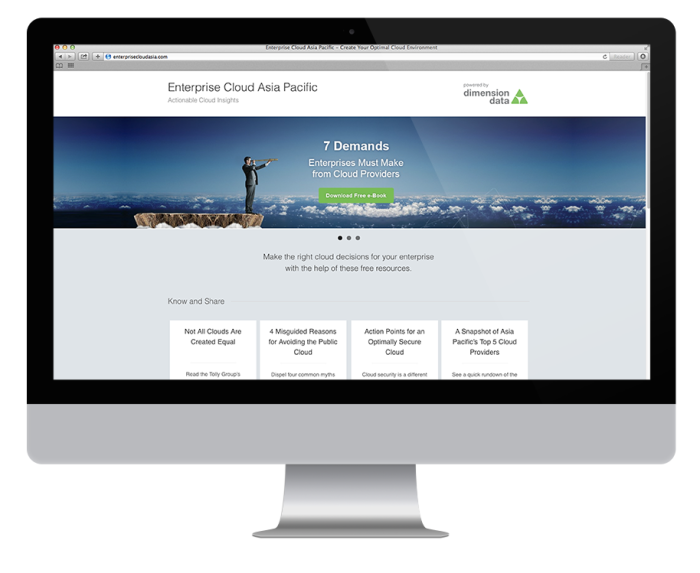 The Enterprise Cloud Asia campaign provides Dimension Data with lead generation, constant lead nurturing, measurable content engagement, and interest-based prospect segmentation. Gating of the long-form content captures qualified leads, while the integrated CMS system tracks metrics such as email open rate, click-throughs, browsing duration and e-book downloads. These give a clear picture of the site’s performance, its reception by the readers, and which readers prefer which sorts of content. The writer is Anol Bhattacharya, CEO of GetIT Comms. For the last 14+ years, Anol has been consulting B2B technology companies like Cisco Systems, StarHub, G-Technology (HGST), Dimension Data, BT Global Services, HP, Orange Business Services, and CyberSource-Visa on behalf of GetIT (Singapore), in the field of B2B marketing, lead & demand generation, lead nurturing, content marketing and social media strategy. He is also editor-in-chief of B2Bento.com <http://b2bento.com/>, a leading blog about news, views and reviews of the B2B marketing space and social media scene in Asia. He is a regular columnist on the topic of B2B marketing in various print and online newspapers, such as Business Times, Straits Times, Marketing Interactive, and AsiaOne. Anol has spoken as a keynote speaker and panelist at major marketing conferences across the region, including Click Asia Summit (Mumbai), AdTech (Singapore), SES (Hong Kong, Singapore), and BMA (Chicago), as well as SiTF Masterclasses.